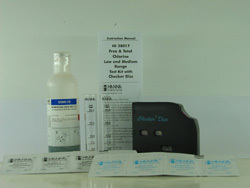 Hanna Instruments HI38017 Free and Total Chlorine kit. This is the one we use in the lab and in the field at Apps Laboratories for quick and accurate chlorine tests on drinking and process water. It has two ranges which means that those trace values can be measured accurately. This kit is specially useful if the combined chlorine leve is needed. Combined chorine is made up of chloramines and is responsible for most of the 'chlorine' smell in water. Chloramines are calculated as the difference between free and total chlorine.This kit is particularly useful in the food industry for checking chloramine levels and disinfection. It is also useful for checking the effectiveness of water treatment to remove chlorine. There are 100 tests for each of free and total and reagent refills can be purchased. To use the kit just add 1 sachet of reagent for free chlorine or a sachet to test for total chlorine. The resulting colour change is determined by the Checker Disk method in which a coloured disk is rotated in front of the sample until the colours match. The Checker Disk uses a blank at the same time to compensate for any orignial colour in the sample. Ranges are 0.00-0.70 mg/l and 0.0-3.5 mg/l with the smallest increments 0.02 and 0.1 mg/l respectively.